Steve Hillman with a mid October beauty, released after a quick photo. I was born in Galveston and grew up on Dickinson Bayou where my parents started a small seafood business in the mid-seventies. When not fishing off of our little pier I would fish out in the bay with my dad, uncles and grandpa. This was back when we didn’t have to venture far to catch trout, redfish and flounder. Reefs in Dickinson Bay, Moses Lake and Todd’s Dump gave us all the action we could ask for. It really wasn’t until my mid-teenage years that I learned how to read the water well. I fell in love with wading and learned what slicks meant. This is when fishing hit a whole new level for me. I caught my first topwater trout on a chrome/ blue jumping minnow on Dickinson Reef when I was around 16 years old. I still remember how rafts of mullet would mark the J-shaped reef. No GPS was needed. In 1996 I graduated from the University of Houston – Clear Lake with a Bachelor of Science in Environmental Management, then took a job in the chemical industry. Within a couple of years I came back to my roots in the family seafood business to take over the marketing aspects of the business. We would fly clients in from all over the country and I would take them fishing and golfing. It was during this time when I realized just how much satisfaction I got from watching others enjoy catching fish. In 2004 I obtained my captain’s license and started running trips. Some folks told me to be careful taking something that I enjoy and turning it into a job. I suppose this is true for some. For me, it was the right choice. I never intended on becoming a full-time fishing guide but the circumstances pretty much played out that way. Now, I have some of the best regular clients that any guide could ever ask for. Funny how things seem to work out the way you least expect. When I started guiding I ran tarpon, bull red, shark, black drum, flounder and trout trips. While I enjoyed all of that I realized that my true passion was fishing for trout and reds. I’m a firm believer in sticking to what you know. And, by doing the same thing day-in and day-out you can stay on the patterns and become better. As Kurt walked towards his truck tears flowed from my eyes. I drove home thinking about how blessed I was. That two day fishing trip with Kurt and his father will forever be etched in my memory as well as my heart. What is your favorite soft plastic and hard bait for trout if you had to choose only one of each? My favorite soft plastic would have to be a Limetreuse Saltwater Assassin and MirrOlure’s MirrOdine XL would be my choice for a hard bait. What is the biggest mistake you see other fishermen make? I would have to say that the biggest mistake I see on a regular basis is other fishermen motoring over fish. Just the other day we witnessed a boat motor through several good trout slicks then line up behind us to make a drift. He was more concerned with what was happening on my boat then what was happening in the water around him. This has become a daily occurrence. I would love to see more awareness and better etiquette. 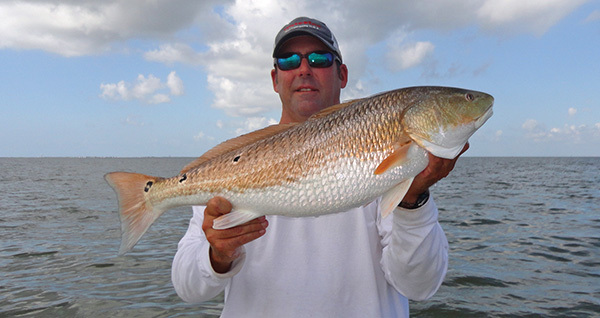 Fat redfish like this one can be found schooling in open water, September through November. 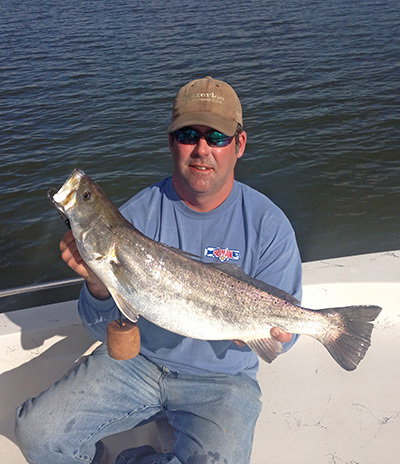 What should anglers key in on during September and October in Galveston Bay? The early days of September are usually similar to our late summer patterns which involve drifting slicks in 7 to 11 feet of water over shell and throwing mainly soft plastics. Depending upon the timing of cool fronts, late September and early October can become more of a transitional pattern where trout are found deep as well as shallow. Slicks and active bait are always good telltale signs but gulls hovering over migrating white shrimp can also lead you to the fish. Wading near marsh drains is always a good plan especially during late October. Trout can be somewhat spread out until a true fall pattern arrives which usually occurs in November. My favorite tide to fish depends on where we’re fishing but our trout seem to feed better during a tide change. If we’re wading the mouth of a marsh drain then I like a high tide going to a low. If we’re drifting open bay reefs then any tidal movement is best, regardless of direction. What is the biggest change you’ve seen in Galveston Bay over the years? I could write an entire article on this subject but I suppose the most noticeable change is the bottom landscape of the bay. Many islands are now reefs and many reefs are now gone. Through the years the bottom structure has changed from environmental changes and man-induced changes. We have lost more than half of our live oyster reefs and all of our rangia clam beds mainly due to Hurricane Ike and other environmental changes. I’ve also seen the number of boats increase dramatically over the years. Do you have a recently discovered lure or new technique you’d like to share with our readers? I’m pretty much a creature of habit who tends to keep things simple. That being said, I seem to be throwing more waking baits such as Strike Pro’s Hunchback this year. It’s a subsurface hard bait that wobbles from side to side. 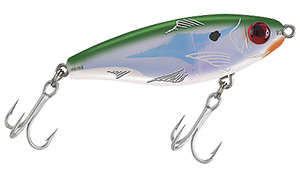 It has a loud rattle that tends to draw strikes when sometimes other baits won’t. Other than that, I usually stick to the basic soft plastic and topwater program. It really depends on what I see while we’re fishing. Favorite place you’ve ever fished? Hands down, my favorite place I’ve ever fished is Baffin Bay. I love catching legitimately big trout and Baffin has produced more big trout for me than all the other bays I’ve fished combined. 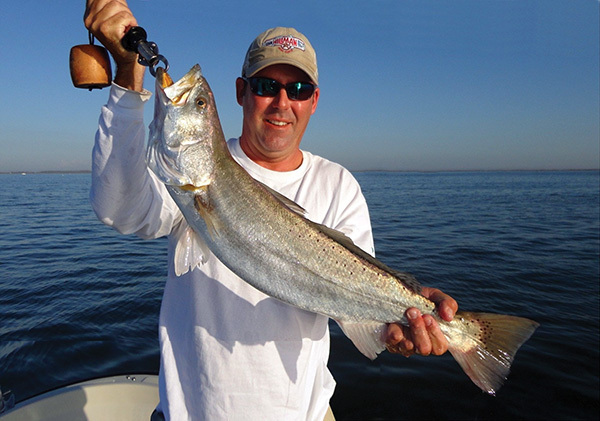 Galveston Bay has produced some big trout for us through the years but not as consistently as Baffin. Steve’s 8.25lb trout fell for a MirrOdine XL. The jury is still out on this question for me. I carefully observe the changes I see on a yearly and daily basis while running my charters. I also study the data from the Texas Parks and Wildlife, as well as others such as the Harte Research Institute. My current opinion is that we’re struggling with habitat in this bay and fishing pressure has greatly increased. Man-made and environmental changes have had a negative impact on our estuary. I don’t think anyone can deny that. The question is what changes should be made? Is a limit reduction to 5 trout the answer? I personally think it’s a good start. Sustainability of our spotted seatrout as well as our habitat should be on the front burner. I thoroughly enjoy fishing but my biggest passion is spending time with my family. My wife and I only have one daughter, and she turns 16 in January. Time seems to pass faster than ever and I don’t want to miss anything that has to do with them. We’re a goofy little family and we can rarely have a serious conversation, but I wouldn’t want it any other way.